Guns N’ Roses have extended the North American leg of their Not In This Lifetime tour with the addition of two months of arena dates in the fall. Following the end of the summer stadium shows in San Antonio, TX on September 8, the band will return for indoor dates beginning October 8 in Philadelphia and wrapping up in Los Angeles on November 24 at the Staples Center and a November 25 appearance at The Forum. The group have also added an August 5 show at War Memorial Stadium in Little Rock, AR with guest Sturgill Simpson to the summer schedule. The news comes after a series of video teasers by the reunited trio of Axl Rose, Slash and Duff McKagan, which traced the timeline of not only the reunion trek but the group’s history, as well. A Citi cardmembers presale runs Tuesday, May 30 at 10 a.m. local time until Friday, June 2 at 10 p.m. local time through Citi's Private Pass program, while an AT&T pre-sale begins Thursday, June 1 at 10 a.m. local time and ends Friday, June 2 at 10 p.m. local time via the AT&T Thanks program. General public tickets will go on sale starting Saturday, June 3 at 10 a.m. local time. 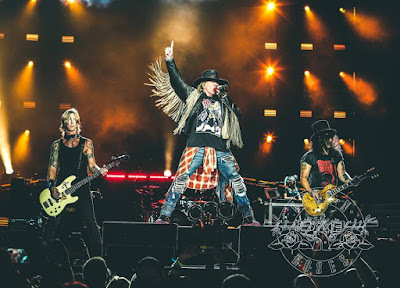 In addition to the fall concerts, Guns N’ Roses have also revealed the opening acts for the stadium shows this summer, which begin in St. Louis, MO on July 27. Guests on select dates will include ZZ Top, Deftones, Sturgill Simpson, Royal Blood, Live and Our Lady Peace. Guns N’ Roses will launch a European tour at Slane Castle in Ireland on May 27. According to a recent report by Billboard, the worldwide tour has grossed more than $230 million since its April 2016 launch.